The current study focuses on the protective role of rational beliefs in the relationship between irrational beliefs and negative emotional states (stress, depression and anxiety) in a sample of Turkish undergraduate students (N = 440). The findings suggest that irrational beliefs, especially the need for achievement, the need for approval, and the need for comfort, are important predictors of negative emotional states (stress, depression, and anxiety). The findings also provide additional evidence for the protective role of rational beliefs. 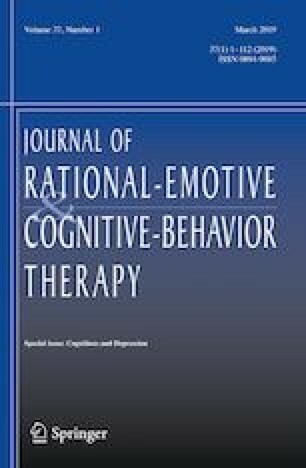 Findings suggest that rational beliefs have a moderator role in the relationship between irrational beliefs and negative emotional states (stress, depression and anxiety). Contributions and the implications of this study were discussed in detail. The authors declare no conflicts of interest with respect to the research, authorship, and/or publication of this article. All procedures performed in studies involving human participants were in accordance with the ethical standards of Social and Human Sciences Research and Publication Ethics Committee of Pamukkale University (Approval Number: 68282350/2007/G05). Informed consent was obtained from each participant.